Eaton’s Cooper Lighting division’s LED luminaires are replacing 6,050 existing parking garage fixtures at the Detroit Metropolitan Airport. The conversion will result in a 66 percent reduction in power consumption with an anticipated overall energy and maintenance savings of about $1.2 million annually. 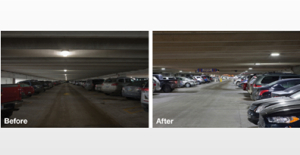 Consuming 60 watts, the McGraw-Edison Valet LED fixtures are replacing 1,200 existing 210-watt, metal halide fixtures in the Blue Deck parking garage and 4,800 fixtures in McNamara Terminal Parking Structure. The Ventus LED pole-mounted fixtures are being installed on the upper open decks. The fixtures are estimated to reduce annual energy consumption by more than 7,345,000 kWh. In addition, the LED products incorporate Cooper Lighting’s LumaWatt Outdoor Wireless Control and Monitoring System, which manages the lighting levels according to pedestrian and traffic safety needs. This entry was posted in Industry News, Industry Resources and tagged Energy, energy savings, LEDs on March 21, 2014 by setpointsystems.